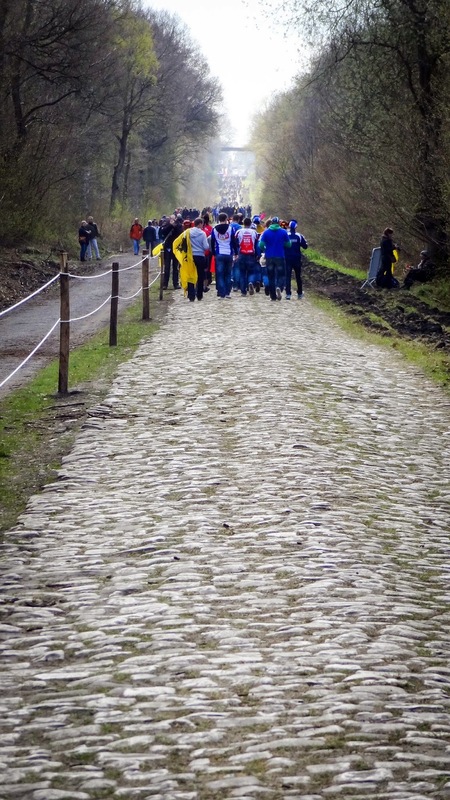 Last Sunday was my most anticipated race of the year - the Hell of the North - the Paris Roubaix. 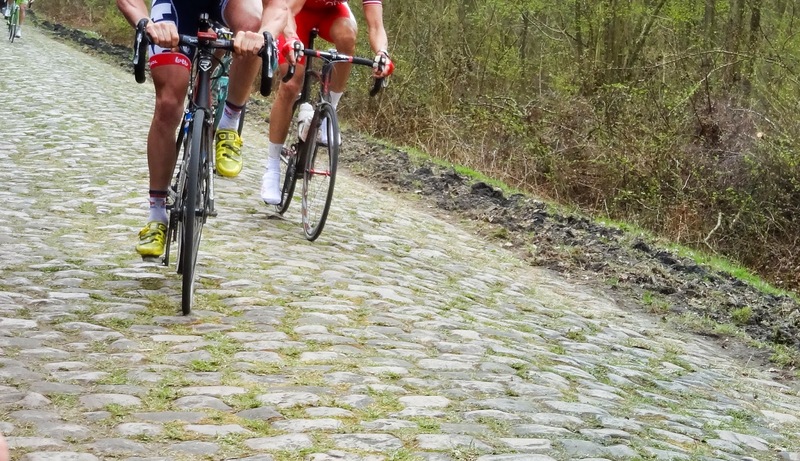 It is the time in spring when I get to watch someone other than the main GC names win a career-making race. 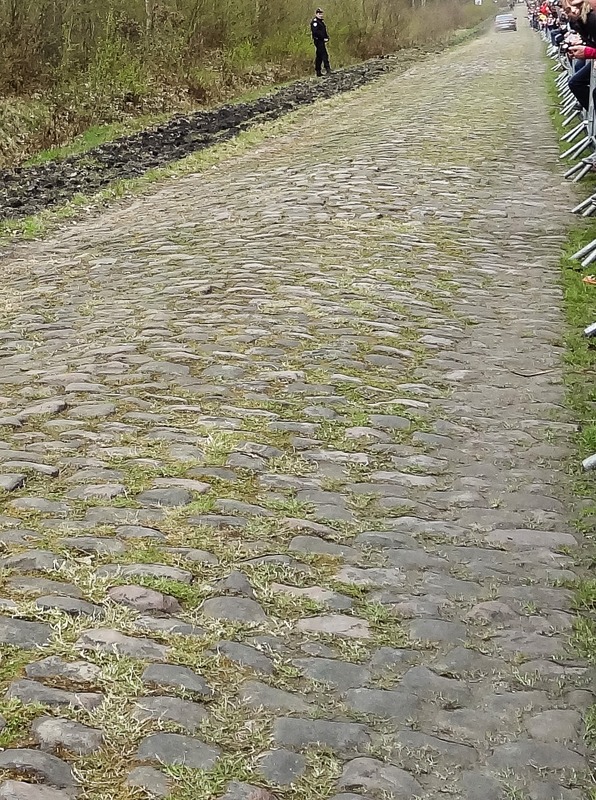 It is the day when tough men race over tough cobbles. 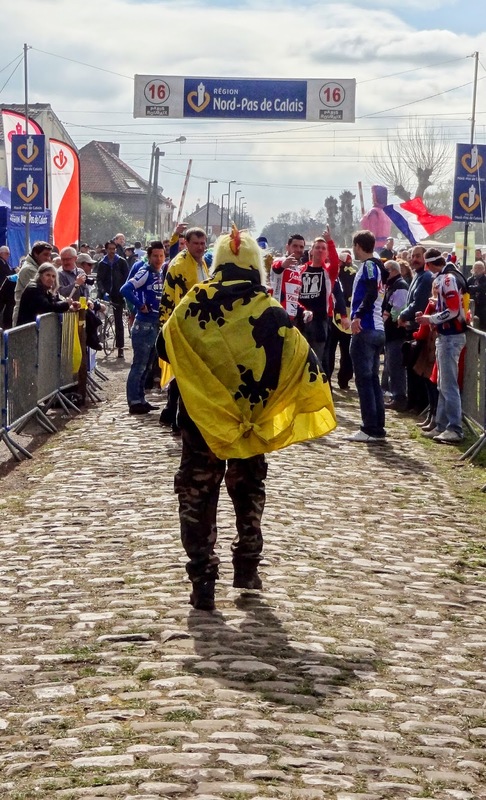 I love the Paris-Roubaix, this year it did not disappoint. When my alarm clock rang on Sunday morning, I shot out of bed. There was no hitting the snooze button. I had prepared the coffee pot the night before, I had made sure my viewing devices were set and channels/websites selected. 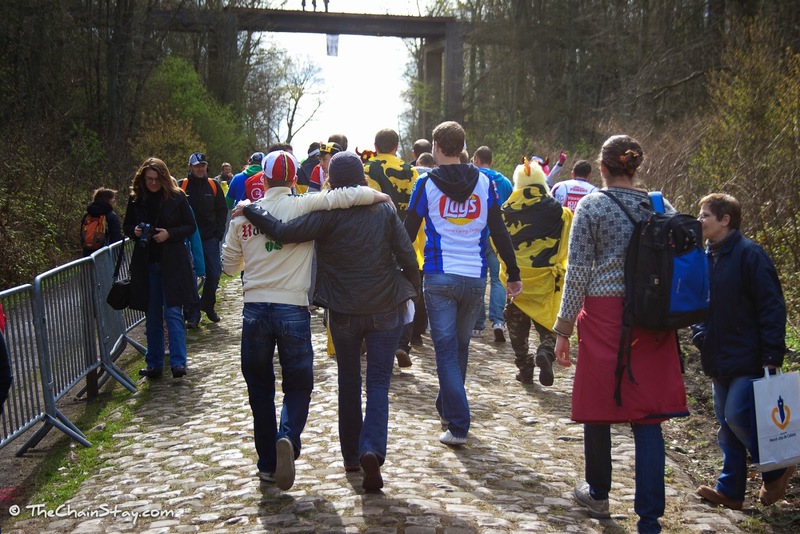 It was the morning of the long anticipated Paris-Roubaix. 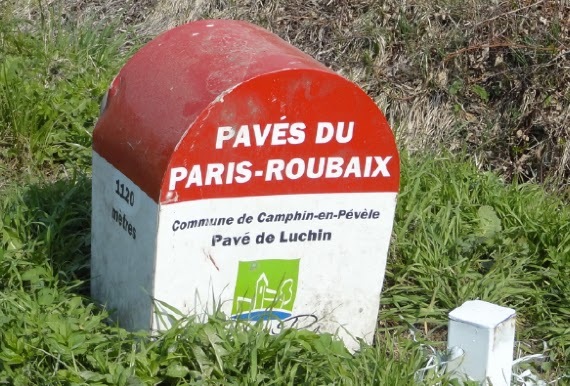 Paris-Roubaix is like Christmas to me. I can't sleep for the excitement and I happily arise early. Last week, I had fun tweeting some images taken when I was fortunate to be a fan at the race a couple years ago. 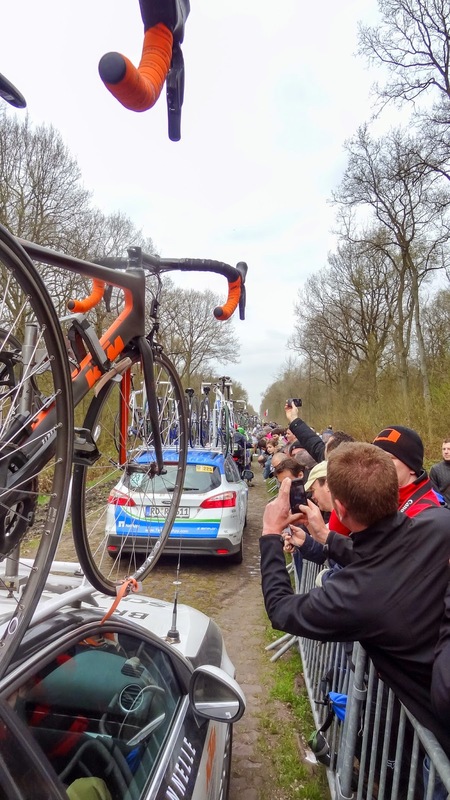 I was there to see the riders inside the Arenberg Forest and again at the restaurant of le Carrefour de l'Arbre. I had watched the race online for years and knew exactly where I wanted to be if I ever got the chance to be there in person. I had sort of hoped for rain and mud, but was instead treated to a fantastic good weather day in northern France. Here are some of the images I tweeted last weekend (with many more I did not tweet). 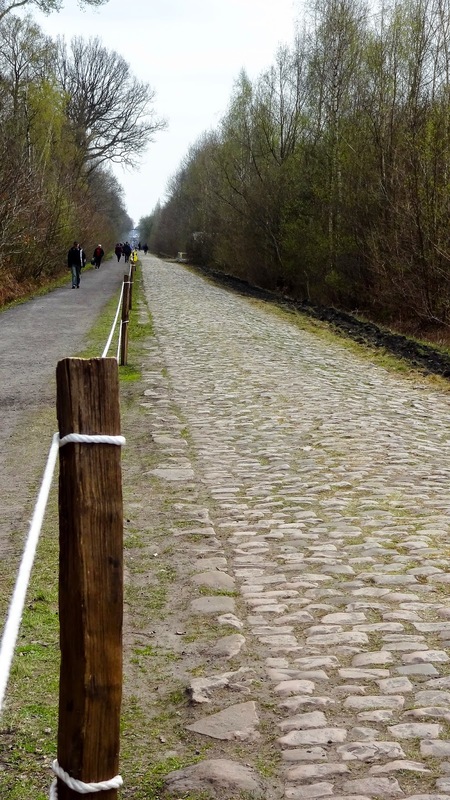 Paris-Roubaix is a tradition and these are sights can be seen any year - even the year you went or will go! These photos are what you might not see on TV - they reflect the loyal fans who go to the race year after year with family and friends. 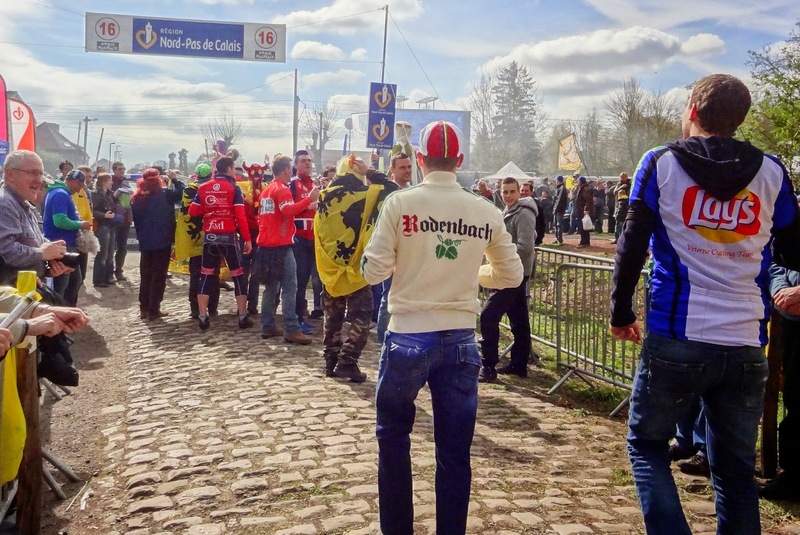 For years I had wanted to be at the Paris-Roubaix as a fan - the experience did not disappoint. We timed it right to walk into the forest behind this fun group! 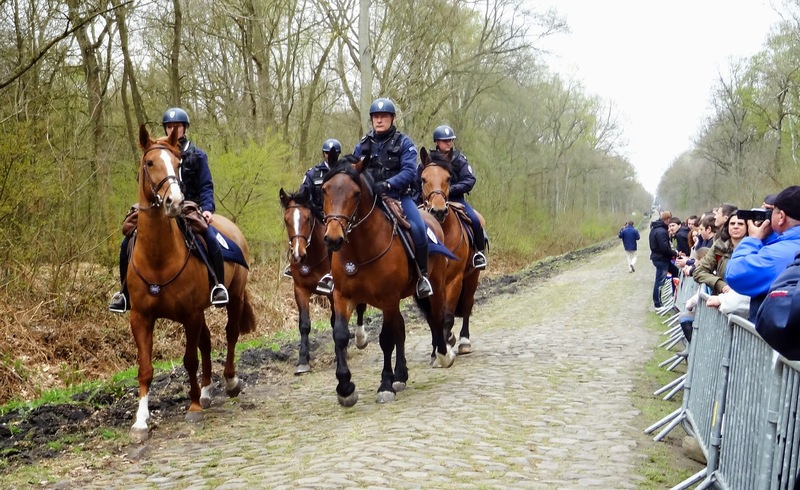 We walked the entire length of the Arenberg forest. Then we got a beer! 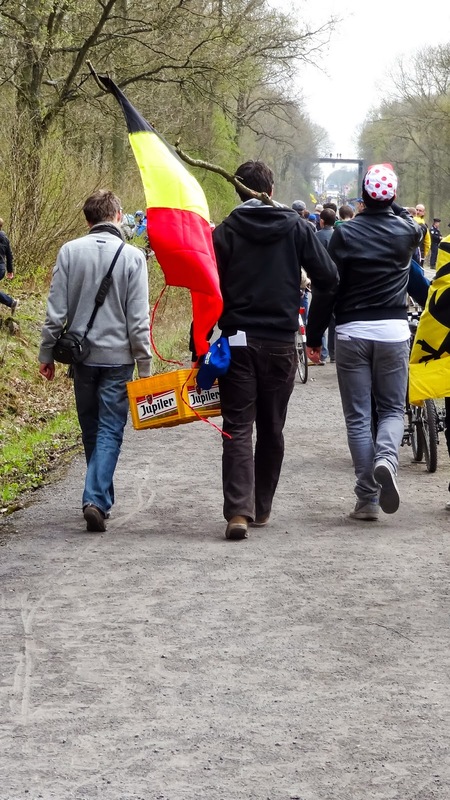 There is a big celebration at the start of the Arenberg sector (east side) with beer tents, entertainment and sausages! 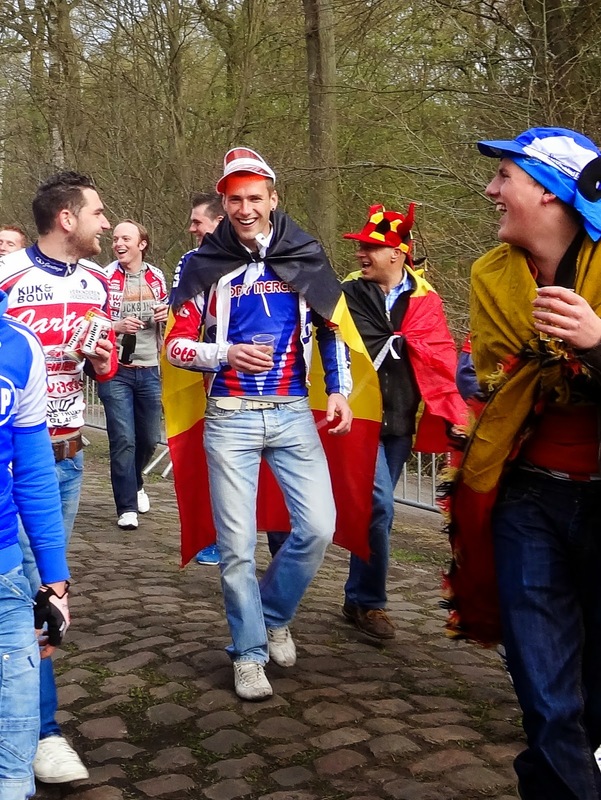 Just a fantastic mood and celebration going on at the start of the Arenberg Forest section of pave. 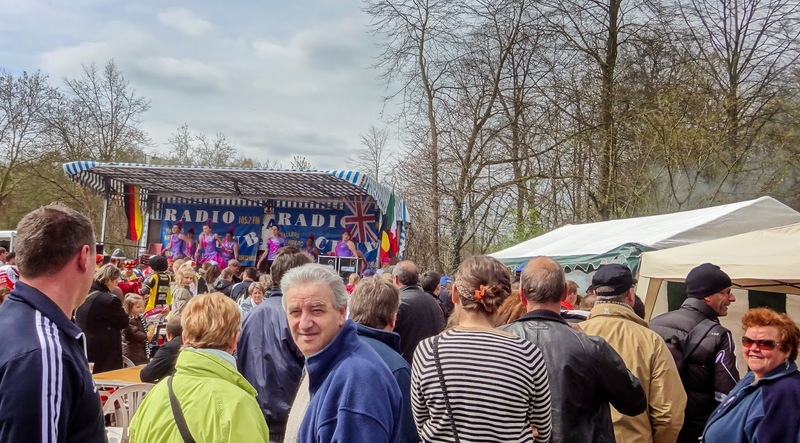 Entertainment stage at the start of the cobbles - I loved singing Neil Diamond's Sweet Caroline with the crowd. 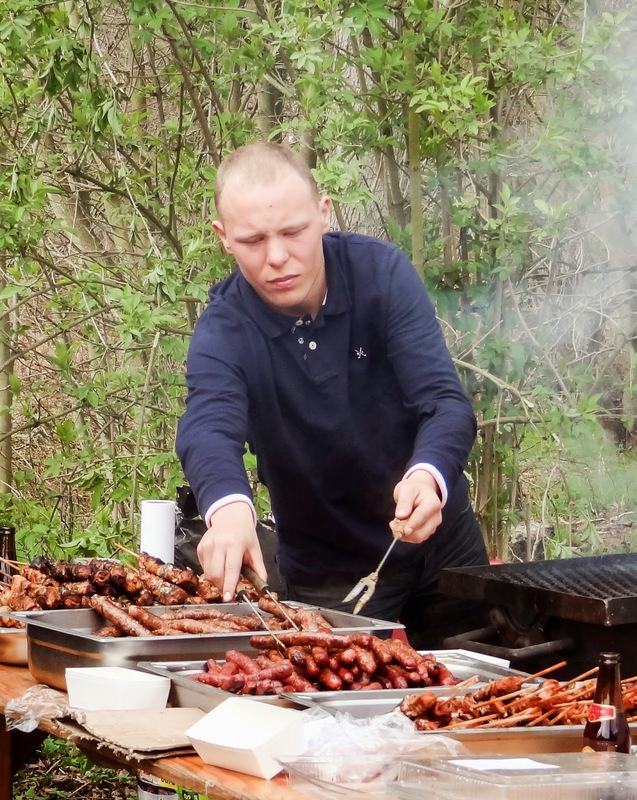 Sausages and frites are a tradition. a French professional cyclist from a family of Polish immigrants, who worked the mines in northern France. The mood is fun and relaxed before the race as the cameras get in place. Photographers piled up on the left side, fans on the right. 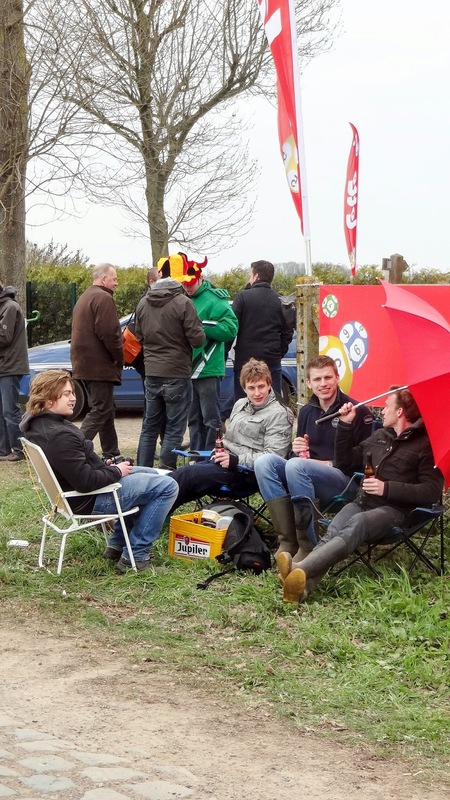 Depending on conditions - fans might line both sides. 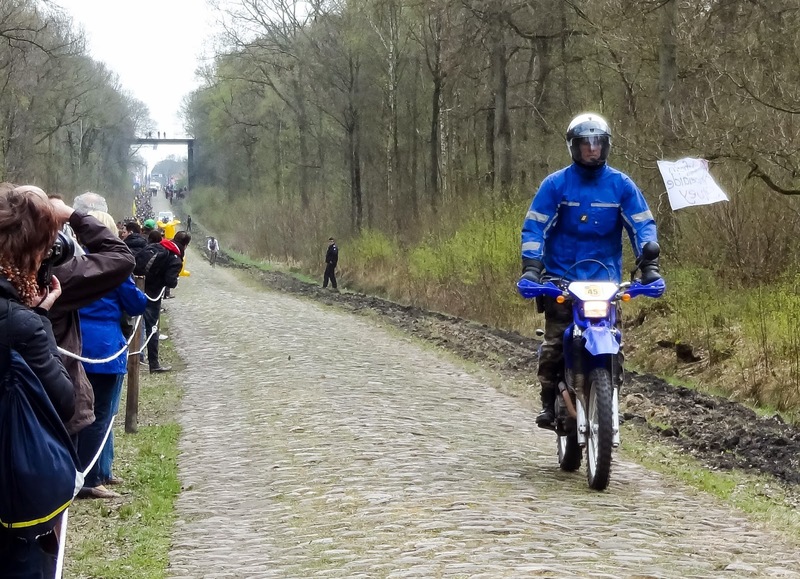 Skilled Gendarmes on motorbikes stand up as they ride the rough cobbles. They are exciting to watch. 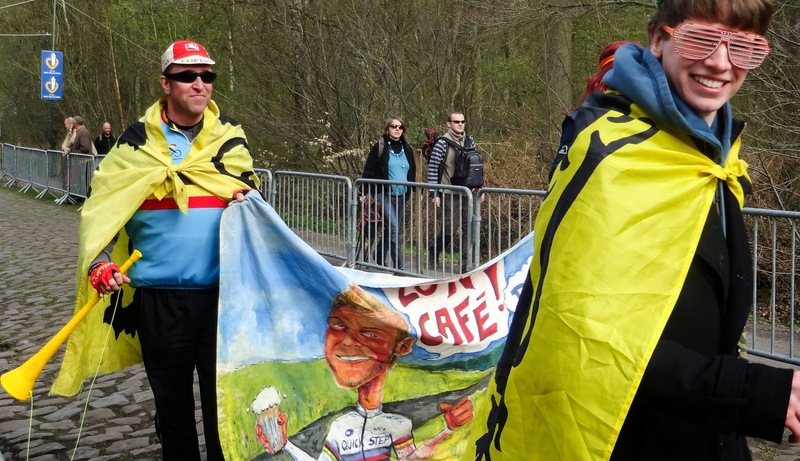 Fans are so close to the action in the narrow passage of the Arenberg Forest! 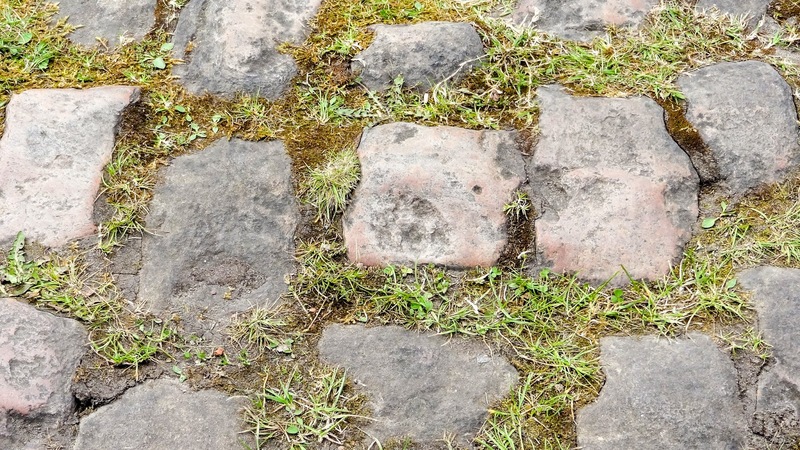 When the moss grows on top and the grass is wet - the convex cobbles are really slick. Being the "professional" photographer that I am - THIS is my first photo of the riders. 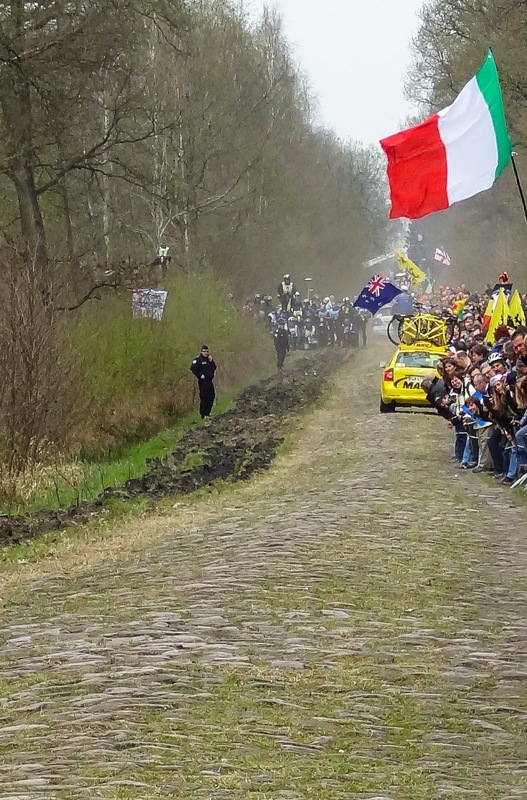 I have a big tip for taking photos at the Arenberg Forest: you are down, the pave raises the riders up; the ground shakes (a lot!) and everyone is reaching in toward the riders -- so just enjoy the moment and forget the photos. 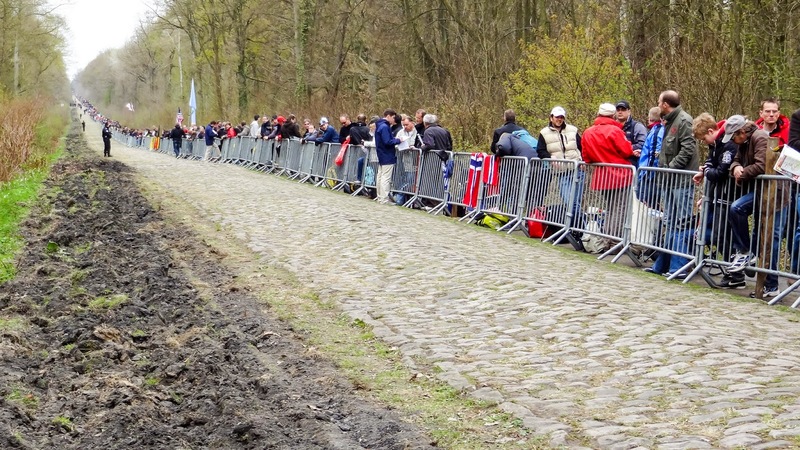 When the helicopters show the riders turning onto this pavement, I know the lead group is through the forest. 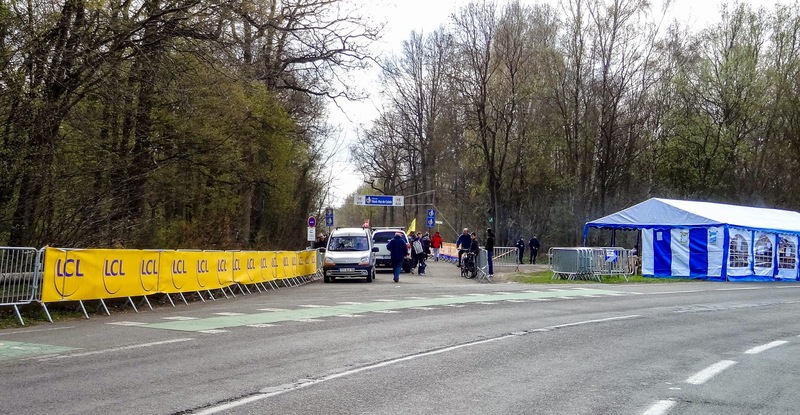 We got in our car and drove to another section of pave to see the peloton yet again, shortly before the finish at the Velodrome in Roubaix. 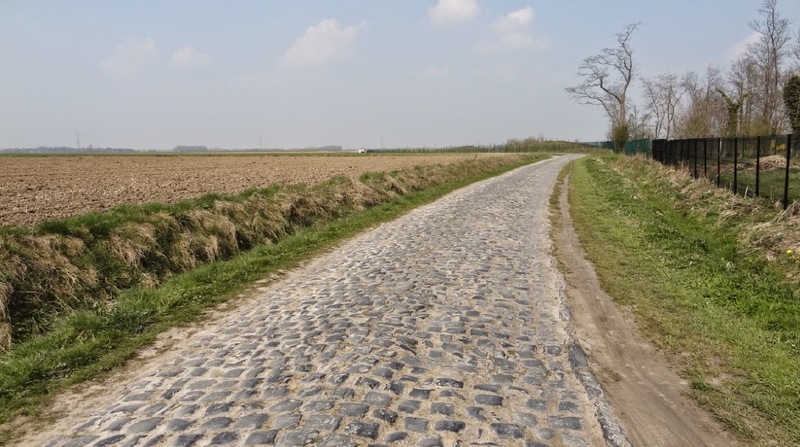 Only a 2 star sector of pave, but strategically, a very important corner of the race. 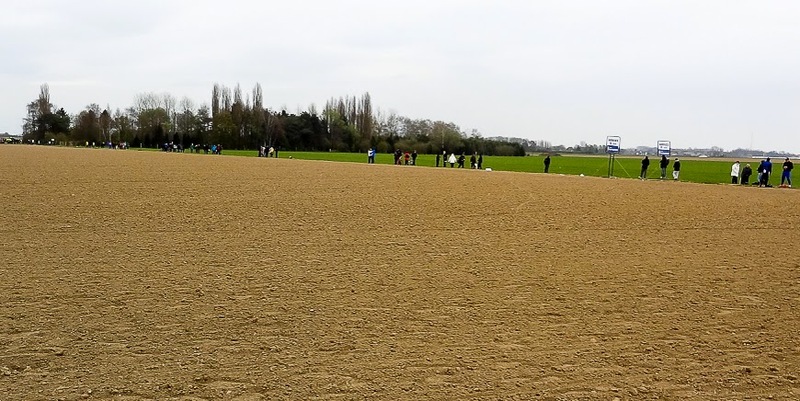 Beautiful working fields of northern France as the fans stretch along the parcours. 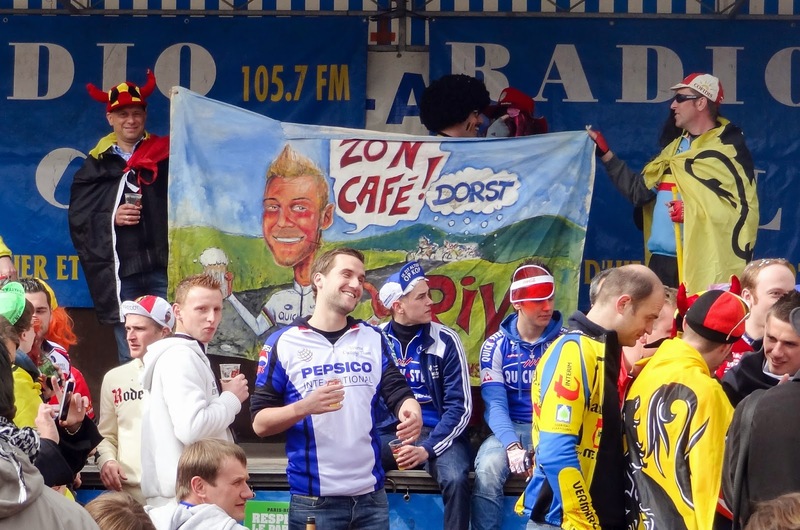 The crowded scene at Carrefour de l'Arbre on race day. 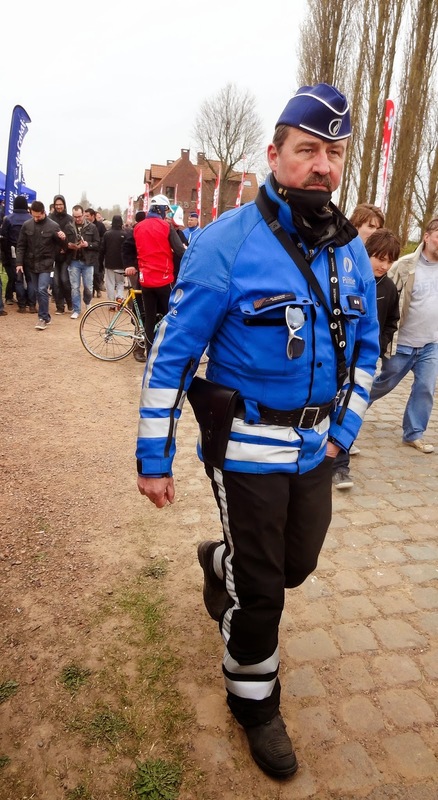 Gendarmes (police men) are everywhere along the course. A great way to spend a Sunday afternoon in France. 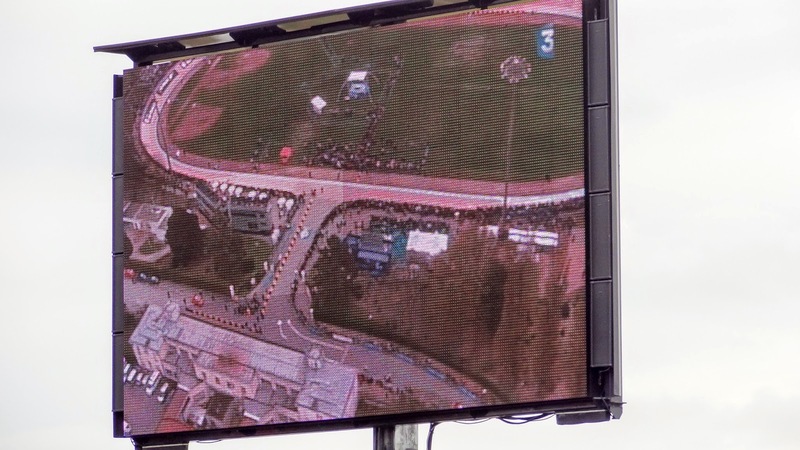 On the enormous big screen TV at the corner near the restaurant of l'Arbre, we were able to see the finish in the Velodrome happening just a short distance away. The crowd roared at the finish. I couldn't believe I was in France on this Sunday in Spring! 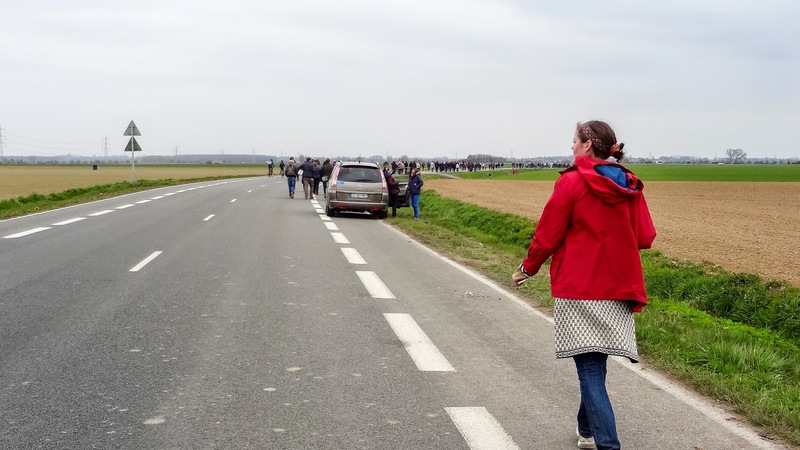 My niece Kristina walking back to the car after seeing the race pass and the finish on the large screen TV at l'Arbre. 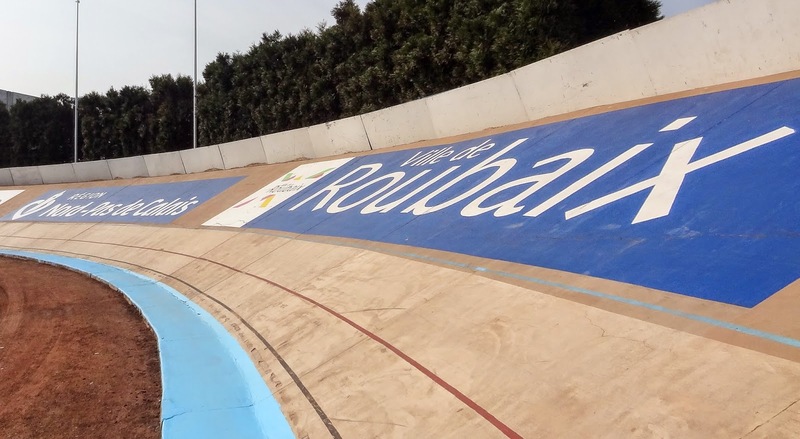 I visited the Roubaix Velodrome on a quiet day earlier in the week, when I could walk the last section of cobbles and walk into the veldrome as the riders would do on race day, imaging the thrill of victory. 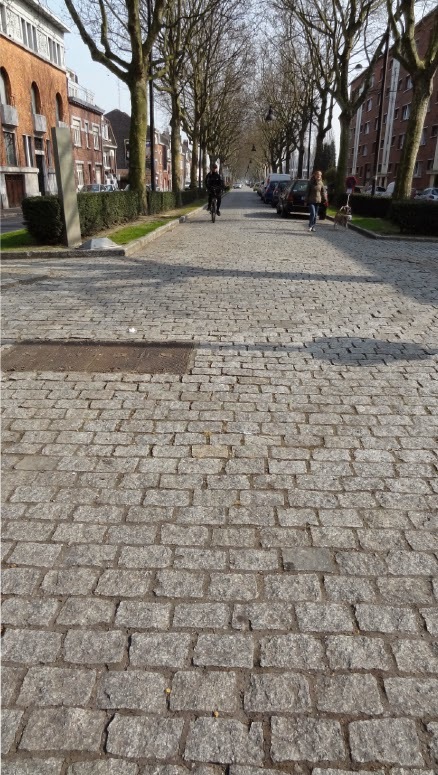 Look down and you will see imbedded in this final section of cobbles, stones dedicated to every past winner. 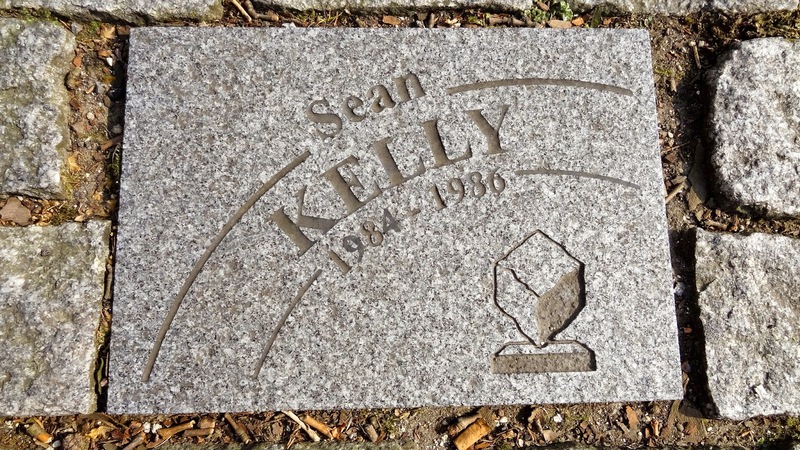 It's great to walk along and discover the names on the stones. 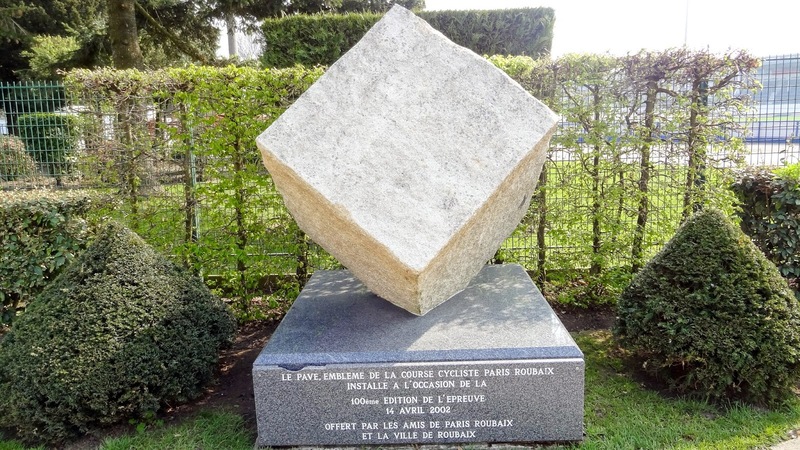 Could you imagine sitting here at the finish line of the Paris-Roubaix. There is no need for seat backs because everyone is on their feet for this finish. 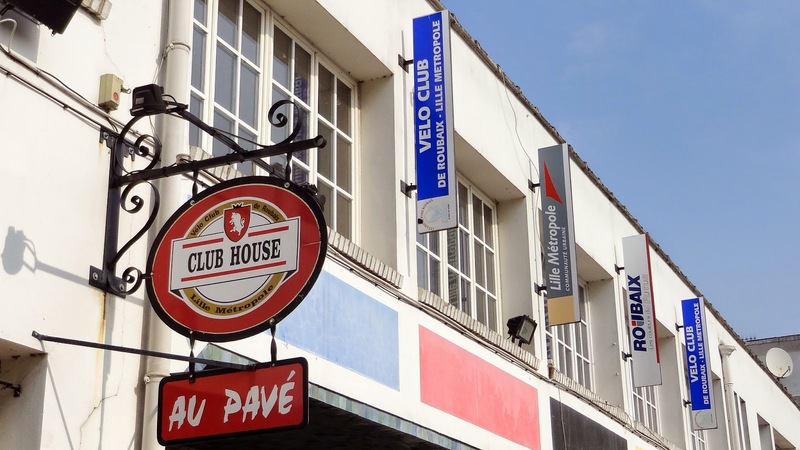 Across from the stadium is the Velo Club du Roubaix club house. It is a museum of sorts inside with a collection of race history. 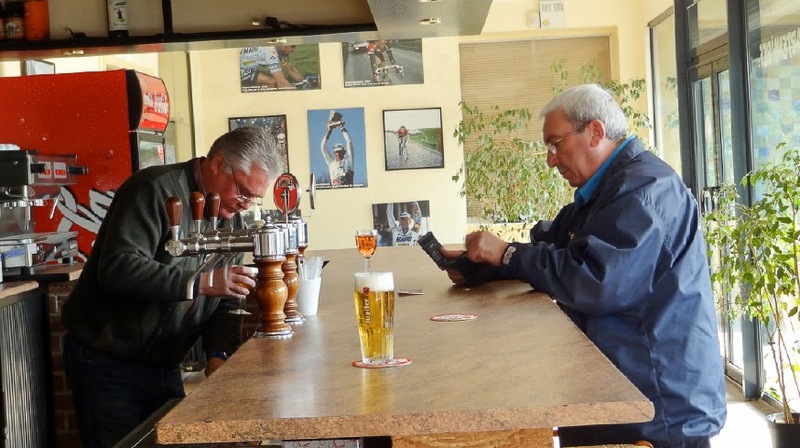 You can go inside the club house for a drink or a look around at all the memorabilia - a must for fans (on a non-race day). 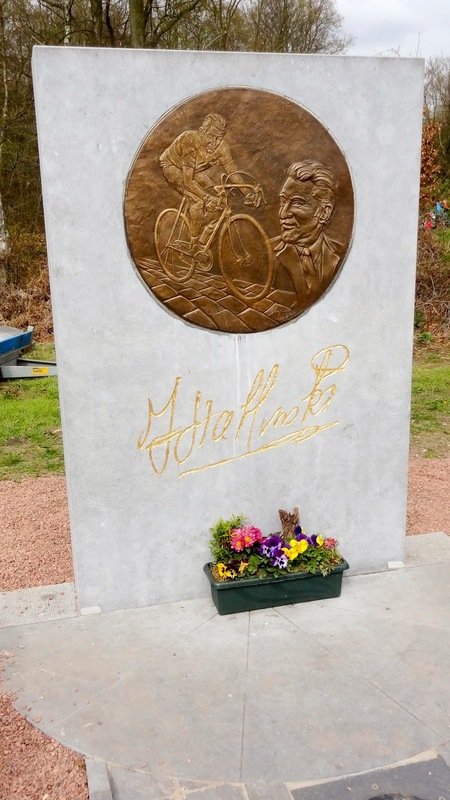 A landmark outside the Velo Club cafe. 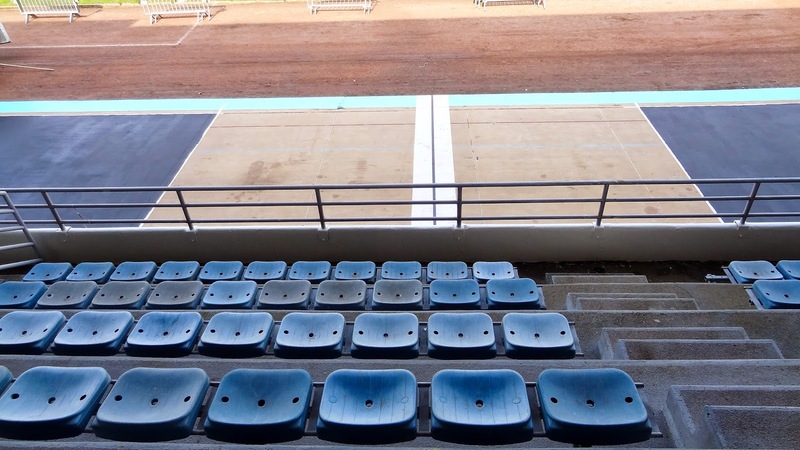 I walked quietly around the velodrome a week before the race and imagined who had won in the past and who would win that coming Sunday afternoon. Study the maps carefully and you should be able to see two sections of the race. 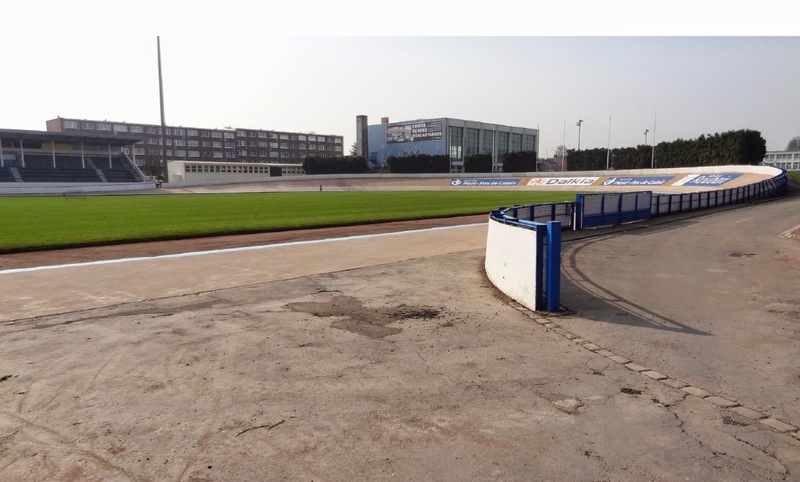 If you want to see the race out on course and in the Velodrome, I would suggest joining a Tour Company for the day. 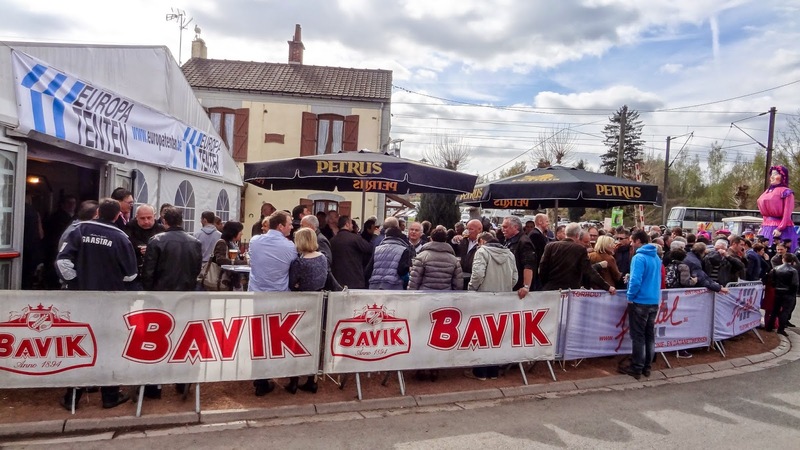 They will navigate the parcours and logistics for you, allowing you to relax and celebrate the race. Gregg Germer of The Chain Stay (one of the Tour Companies I would highly recommend) snapped this picture of me (center) with my arm around my new found friend who was teaching me drinking songs - in a language I did not understand at all - but sing I did. 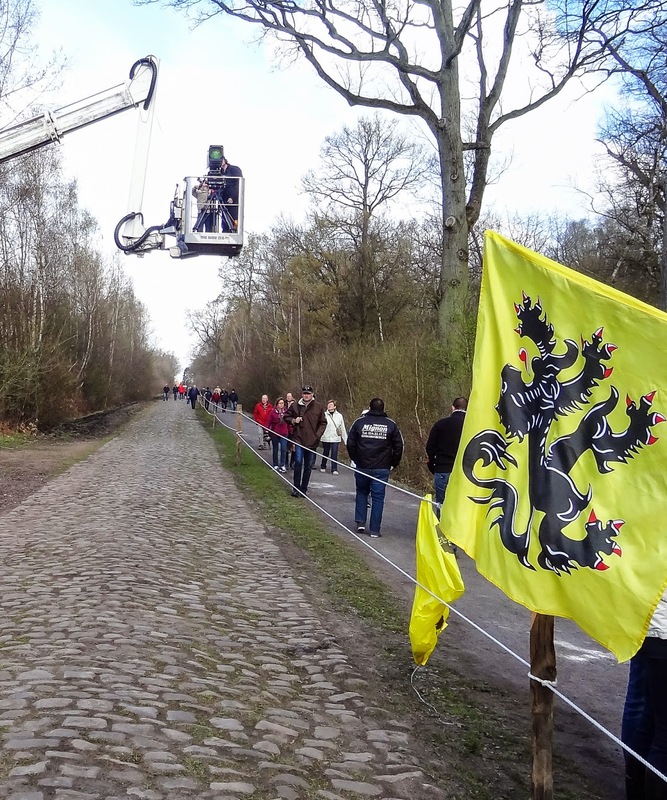 We were about to walk under the famous landmark of the train trestle in the Arenberg Forest on Paris-Roubaix day! I can't wait until next year. I plan to get up at 5:00a.m. again. 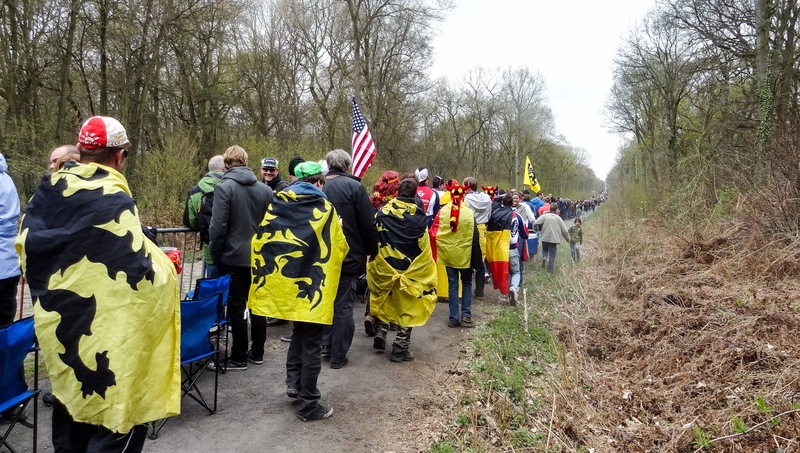 Maybe even 4:45 a.m. when race coverage goes live in the U.S.A..
Realated blog post by Pedal dancer®: American Again (returning from traveling in Belgium).